Roger Waters, co-founder and principal songwriter of Pink Floyd, fuses the epic and the personal in Roger Waters The Wall, a concert film that goes well beyond the stage. Based on the groundbreaking concept album, Roger Waters The Wall could be called a concept film: it's a state-of-the-art show that dazzles the senses, combined with an intensely personal road trip that deals with the loss Roger has felt throughout his life due to war. In a traditional rock concert, viewers are often treated to a live performance of a band playing their hit tracks on stage with some occasional visual flourishes. Sure, there might be some flashy costumes or intermittent pyrotechnics, but by and large, audiences pretty much know what to expect. 'Roger Waters The Wall,' however, is not a traditional rock concert. Marked by an audacious and nearly unprecedented production, the show is an elaborate and spellbinding explosion of sight and sound, fully bringing Pink Floyd's legendary album to life like never before. And as presented here in this concert film, the filmmakers take the material even further, creating a powerful cinematic experience that is both rousingly theatrical and deeply personal. 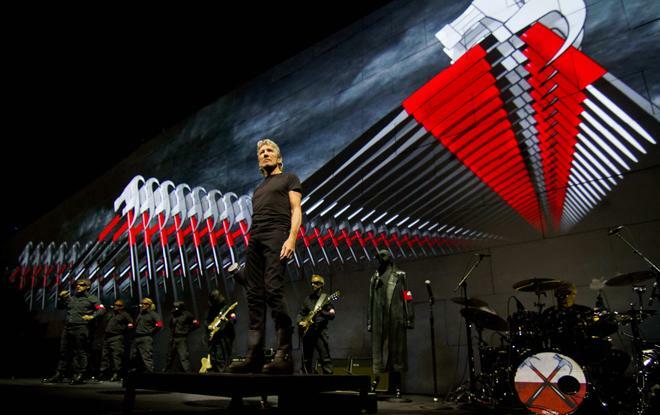 Filmed during the production's live 2010-2013 tour, 'Roger Waters The Wall' presents the full concert experience, offering Pink Floyd's seminal album, 'The Wall,' in its entirety. But much more than just a conventional rock show, the concert itself is a complex theatrical production in its own right, filled with extravagant effects and imagery. Likewise, the film intersperses road trip segments with Waters as he meets up with family and friends to elaborate on his own personal connection to the concert's anti-war message, bringing added depth to the music's themes. Elaborately designed for stadium venues, the concert is an explosion of visual and auditory spectacle. And, living up to the album's namesake, at the center of this marvelous production is an actual wall. Built from hundreds of individual "bricks," the massive barricade is constructed piece by piece by stagehands throughout the show while animations and appropriate imagery are projected onto the towering blocks. Eventually, the wall starts to cover up the band itself, completely masking them behind the structure for several tracks. That is, until the oppressive barrier finally comes crashing down in a rousing climax. Moody lighting, pyrotechnic explosions, costumes, and extras litter the stage as well, all coming together to expand upon the music's content with assaultive visuals that make traditional rock concerts look like amateur acts. Offering a comparatively low-key break from the on-stage spectacle, are several filmed detours that follow Roger Waters as he embarks on an intimate road trip to visit his grandfather's grave and his father's memorial -- both soldiers who lost their lives in battle. Along the way, he meets up with family members and friends as he engages in conversations about life and the pitfalls of war. These documentary bits are mostly engaging, with solid insights, emotion, and a delicate cinematic style that blends surprisingly well with the concert's more aggressive temperament. With that said, some of these scenes are more engrossing than others, and a few segments come across as superfluous or overly dramatic (a sequence featuring Waters getting teary eyed as he reads a letter in his car is a bit much). Likewise, though heartfelt, some of Waters' anti-war musings comes across as a tad preachy and overbearing, both on and off the stage. Of course, these filmmaking excursions all come secondary to the concert's true highlight: The music itself. For those unfamiliar with Pink Floyd's legendary album, "The Wall" remains a true touchstone of conceptual rock music, blending powerful themes of isolation with thoughtful lyrics and compositions. Fueled by the band's progressive rock style marked by extended instrumental riffs, the track list includes notable and enduring songs like "Comfortably Numb," Hey You," "Mother," and the three part "Another Brick in the Wall" -- which all come together to weave a story of cyclical separation and dwindling human connection. And helping Waters to bring these tracks to life is a collection of great musicians, including Snowy White, Graham Broad, Jon Carin, Dave Kilminster, and G. E. Smith (sans the Saturday Night Live Band). Proving that the album's lasting music and timely themes haven't lost any of their striking power, 'Roger Waters The Wall' presents Pink Floyd's rock opera with all the theatrical bravado that it demands. More than just a stellar concert, the film offers a truly cinematic experience coupled with some intimate moments from the musician. Though there are some lulls in the documentary footage, the movie becomes an engaging and memorable anti-war musical spectacle -- one that separates barriers and lays down weapons in favor of a microphone, guitars, drums, and a lingering trumpet. 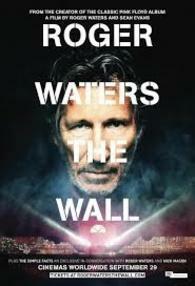 Universal presents 'Roger Waters The Wall' in a 2-Disc Blu-ray/Digital HD combo pack. One BD-50 disc and an exclusive BD-25 Blu-ray bonus disc come housed inside a standard keepcase with a cardboard slipcover. Instructions for an UltraViolet/iTunes digital copy are also included. An Amazon exclusive Special Edition will be released on December 15th as well. After language selection and some warnings and logos, the disc transitions to a traditional menu screen. The movie is provided with a 1080p/AVC MPEG-4 transfer in the 2.40:1 aspect ratio. Outside of some minor technical issues, this is an absolutely gorgeous image, fully bringing the cinematic concert to life. The digital source is mostly clean and pristine but there are some occasional signs of noise and false contouring, particularly in dark portions of the screen and during transitions like fades and dissolves. Likewise, some crowd shots feature a lower grade appearance. Thankfully, the rest of the transfer is rather stellar, with a sharp and life-like picture full of intricate fine details and dimension. The show's elaborate production design is highlighted in full force with sumptuous colors and sharp textures and every spark is visible on screen during the show's pyrotechnic explosions. The on-stage lighting scheme often emphasizes a bold red glow that pops from the screen, and the documentary segments in between the show offer vivid yet natural saturation. Black levels are deep and inky without crushing, and contrast is balanced well. Despite some periodic but not obtrusive artifacts, 'Roger Waters The Wall' looks absolutely incredible on Blu-ray, just narrowly missing the 5-star mark. The film is presented with an English Dolby Atmos track and an English LPCM 2.0 track. A massive collection of subtitle options are also offered including English SDH, French, and Spanish. For the purposes of this review, the track's Dolby TrueHD 7.1 base audio was evaluated. Simply put, this is one of the most impressive concert discs that I've ever heard. From the moment the first note blares from the speakers, audiences will know that they are in for something truly special. Vocals are crisp, full-bodied, and well prioritized -- though in a slight departure from some concert discs, they are not always relegated to the center speaker, and are often spread throughout the soundstage. Each instrument comes through with deep presence and fidelity, offering intricate and deliberate separation that spreads musical effects throughout the room -- creating a fully enveloping "wall" of sound (pun very much intended) that engages the front and surround speakers. Crowd reactions are also appropriately expanded to the rears, further immersing audiences into the concert experience. The show is also home to a plethora of other sound effects, and the design work is nuanced and aggressive, blending ticking clocks, mocking laughter, jolting gun shots, overheard planes (which smoothly transition from the front to the back), and explosions into the track. Throughout it all, bass activity is clean and commanding, offering powerful low frequencies that remain perfectly balanced. Outside of the music, the documentary material also sounds great, with properly centralized dialogue and subtle design work that provides delicate nature ambiance. Unlike the video, the audio here doesn't narrowly miss anything. This is a 5-star surround sound presentation through and through. In other words, this is the definition of a demo disc. 'Roger Waters: The Wall' is among my top five favorite Dolby Atmos mixes of the year (along with 'Fury Road', 'Gravity', 'The Fifth Element', and 'Dracula'). In a 7.1.4 configuration made up of the KEF Q Series speakers (full review HERE), Dolby Atmos takes everything Steven describes above -- a wall of sound, nuanced effects, and clean bass -- and enhances the whole experience by raising the complex soundstage up and around the audience. I love the sensation of strafing fighter planes roaring overhead, while the cheering crowds fill rear speakers, and the broadness of the music across the fronts. This is a special mix for a special concert-film-documentary that not only bests a few Atmos-mixed action movies in its ability to immerse the audience, but will prove rewarding for Atmos fans and audiophiles alike as a go-to demonstration disc. Universal has provided a solid collection of supplements, including a Blu-ray exclusive bonus disc. All of the special features are presented in 1080p video and Dolby Digital 2.0 audio (Disc One) or LPCM 2.0 audio (Disc Two). A Visit to Frank Thompson (HD, 5 min) – This brief featurette follows Waters as he shares the story of Major Frank Thompson and takes a 2013 trip to pay tribute to his grave. Time Lapses (HD) – Time lapse videos showing the elaborate stage constructions, equipment setups, rehearsals, and filming for the shows in Athens (6 min) and Buenos Aires (4 min) are viewable separately. 'Roger Waters The Wall' is a powerful concert film that highlights the live show's cinematic spectacle along with an intimate road trip with the famed musician. Despite some minor technical issues, the video transfer is strong. Meanwhile, the audio mix is essentially flawless, offering an enveloping 5-star track. Likewise, Universal has provided some worthwhile supplements, including behind-the-scenes footage and bonus performances. This disc is highly recommended for all viewers, and the release is an absolute must own for Pink Floyd fans and audiophiles.